Between my wife and I, we get a lot of teaching and educational journals. In the latest edition of The Reading Teacher, Bridget Dalton writes about the connections between multimodal composition and the Common Core standards, and she notices many openings for bringing technology and emerging literacies into classroom instruction. I agree, although I would have liked more overt references to how technology is changing our view of writing in the Common Core, but maybe that is asking too much at this point. “The fixed display of the printed page is being transformed on the screen into an interactive, dynamic experience that can be manipulated across time and space by the reader/viewer and the author.” — page 334. She then ventures into the idea of a Digital Writing Workshop (which Troy Hicks has also done with depth in his Digital Writing Workshop book) and touches on issues of developing not just scaffolding of instruction with technology and composition, but also, establishing the idea of a “design community.” I love this concept, since design is a critical part of digital composition — particularly as we merge media together into something new. And, to be frank, not many teachers teach design. One area of interest for me is in a section Dalton entitles “Pitfalls!” where she tries to lay out things to avoid. I liked her idea that we, teacher, cannot scaffold too much because that limits what students envision for themselves. She also encourages teachers to dive in and not wait for expertise to arrive. The only way to know the possibilities is by doing it, playing with it, and using it. But she also suggests that writing not come first. 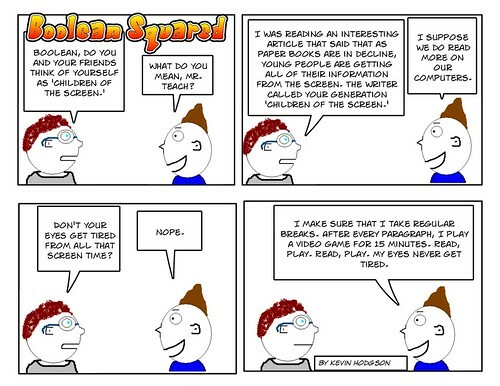 She suggests that while “… we often ask students to write first and then to enhance what they’ve written with media. For many multimedia compositions, this is not the way to go.” While she acknowledges that some students benefit from writing first, others need to create first and then backtrack to writing. While I agree with Dalton that there is a “back-and-forth” to digital composing — a constant shifting in strategies that can seem disorientating but often has a certain logic to it — I still believe that writing remains at the heart of digital composition, even if it is reflective writing that gets them started. My view of technology is that ideas are best developed by writing, and then creating, and I have come to this by watching too many of students lose focus on their work because they did not have their ideas in place as guideposts (which I always tell them can be reshaped by their experiences in a project). Still, I see where she is coming from, and when we think of the various strategies of our students as writers and media creators, it may make sense to have a bigger picture of what helps who. The tricky part is providing them with enough varied experiences, and reflective moments, to understand what works best for them. And those reflective moments? Yeah. That would be writing. I agree, and hope that Morrell’s work will further dive the division of the digital native/immigrant into the ground, and also, buffer the idea that teachers and librarians are in the ideal place to help young people navigate and make sense of this media-rich, technology-infused world, and become critical of it all so that they have choice and agency in their lives. I’m looking forward to following Morrell’s column and learning from his work and his perspectives. These are the scientific themes that my students are developing for their video game projects. It’s no surprise that the Layers of the Earth is top choice, since the symbolic use of “levels” in the gaming platform transforms nicely into the “layers” of the Earth. They had to choose an idea from their Geology unit, and they will be working in specific scientific vocabulary into their game, along with a “story frame.” Many are now deep in their game development, even though we just started talking about storyboarding yesterday. But who am I to hold back the wave of interest and creativity? Those who are regular readers here know that I advocate working alongside students as writers and creators when doing projects. 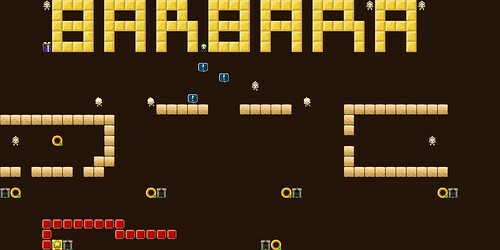 Last year, as part of our first video game design unit, I created the following video game. Since they were doing a science theme, I wanted to do a science theme. 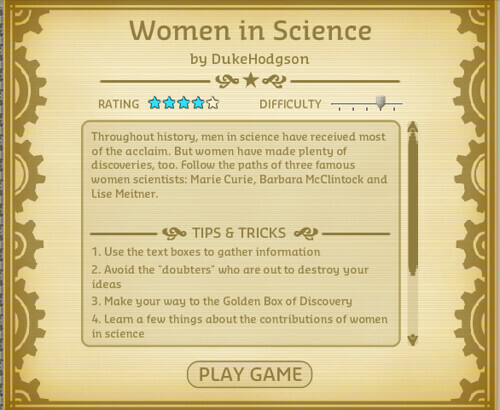 But I was wary of doing a game too close to what theirs should be built around (geology concept), so I decided to do a game about famous women scientists. 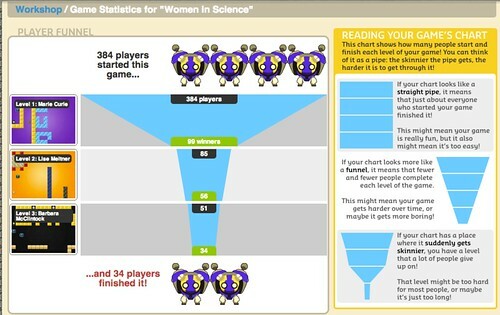 It would also give them a lesson in recognizing the achievements of women in scientific discovery. 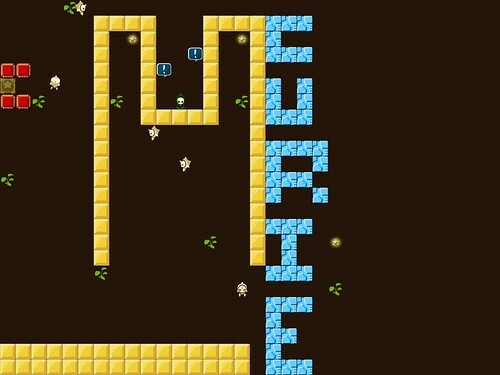 I spent time this weekend playing my game (and realizing how challenging it can be … but not impossible!). I don’t think I will change much about it, but I did want to share out some things in Gamestar Mechanic that show how helpful the site is for young game developers like my students. Here was the first salvo in our conversations. I created a video piece for Anna, remembering an experience that opened my eyes to the possibilities of online writing, and I end by asking her to respond. But you can, too, either here or at Digital Is. And part of what we are doing is reflecting on our experiences. 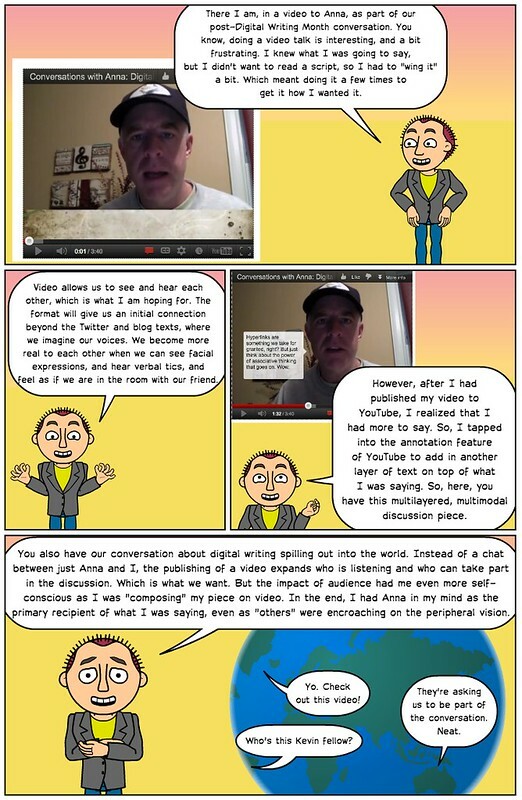 I created a comic reflection of what it means to use video as your canvas for this kind of talk. The other day, I asked one of my classes of students what their parents were saying about the start of our video game unit. Mostly, it was “get off the computer” and “why are you playing video games for homework” and such. Hmmm. I felt like we needed to let parents know why we are doing what we are doing, and invite them to see some of our past work. So, we worked up this note that we sent home on Friday. We are about to start an innovative collaborative project that connects science, English Language Arts and technology together through a video game design unit. You may be wondering what role video games and gaming might have in the classroom. 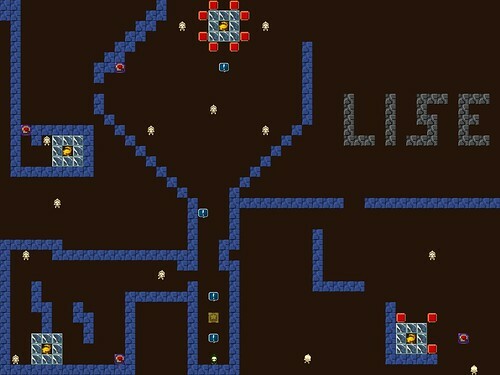 Our goal with this project, which we piloted last year, is to increase vocabulary and content knowledge of a difficult Geology unit in Science class, investigate how game design theory can inform creative and informational writing, and engage students in literacies that incorporate but also move beyond traditional reading and writing. 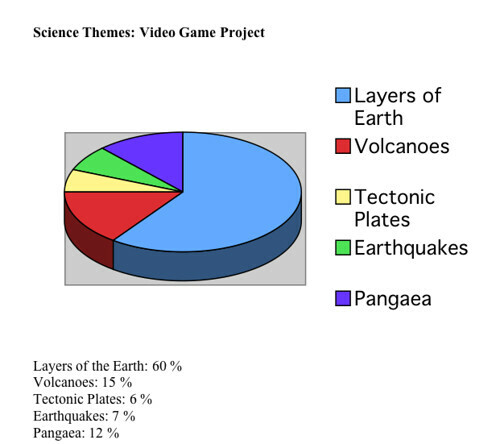 We are using a site called Gamestar Mechanic (http://gamestarmechanic.com/) and students will be designing, building and then publishing a video game along a scientific theme. Gamestar Mechanic is a site that is built around teaching of game design, and as students play games, they are learning the fundamentals of game design, and earning the right to publish their own games in the Gamestar community. There will also be the option to submit their games to the 2013 National STEM Video Game Challenge. (STEM means science, technology, engineering and math). Last year, Norris students submitted about 15 games to the challenge. (We didn’t win but the level of competition was another motivational strategy for many students). I’ll provide more information when it comes available. The goal of this collaborative project between science and ELA is to teach students how to understand and use the elements of good design, how to use a story narrative to structure a gaming experience, and how to connect good writing practice with game design theory. We also want to shift our students from their role as players of games to the role of creators of content. This shift is vitally important in the information age. We documented much of our work last year and I invite you to look at the website that we created. This resource has become a model for work in many classrooms around the country, and other parts of the world. I also encourage you to look over the packet of project guidelines that students will be receiving early next week. I’ve already received a few responses from parents, thanking us for the information and expressing excitement about the way the project is going to engage their children. Three Cups of Tea: Does It Matter If It’s True? This is a bizarre book. Which is not to say the second installment in William Joyce’s new series of The Guardians of Childhood is not interesting, but it is bizarre. E. Aster Bunnymund and the Warrior Eggs at the Earth’s Core picks up the story where the first book — about Nicholas St. North — ends, and the battles against Pitch, the Nightmare King, continues. While the first book established the mythology of Santa Claus (although, never outright), this one establishes the myth of the Easter Bunny (but again, never outright). Here, our heroes — Nicholas St. North, the wizard Ombric and the girl, Katherine — must venture down into the center of the earth to save their young friends who have been kidnapped by Pitch (who wants to use them as leverage to gain access to magical powers). 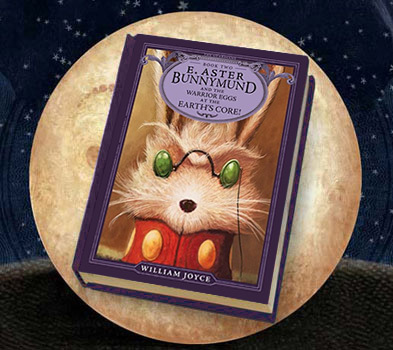 Along the way, they meet and learn about the Pooka, a long-eared, long-lived creature called Bunnymund who hails from outer space who keeps tabs on the Earth from the center of the planet. This is the bunny, and he has an army of warrior eggs which made my son crack up every time he saw pictures. They are funny things – eggs armed to the teeth with bows and arrows. This series is tied into the movie franchise now underway, and Joyce is clearly developing alternative histories to common icons of holidays and stories and traditions — next up is the Tooth Fairy. While I find myself slipping in cynicism (thinking: these books are merely props for the movies aimed at kids like my son), I also find myself acquiescing to the adventure of the stories, and the ways that Joyce weaves magic and adventure, along with the power of belief, into the narratives. The books are good for read-aloud, and my son is thoroughly enjoying them. He gasped when it seemed as if North was going to die from a sword wound by Pitch. He jumped off the couch with a prediction about the connections between Pitch and Katherine. He guffawed at the sight of Bunnymund using his power to transform into a bunny warrior. And in the end, that’s what’s important, right? PS — by the way, the bunny looks very different in the book as compared to the movie. The beefed up the movie version into more of a warrior, and adding Hugh Jackman’s voice gave him more depth as warrior. This is helpful to show my students, so they get a sense of where video games came from, and where they are going, as we work on video game design in our classroom over the next two weeks. 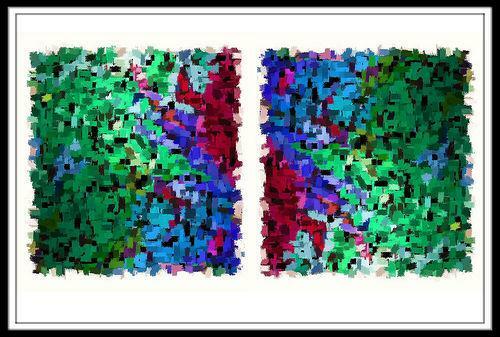 Plus, it reinforces our work around remixing content in new ways. Yet another thing to make me feel guilty …. I was on my way home from a meeting the other day when I heard an NPR news report about the changes being done to the Diagnostic and Statistical Manual of Mental Disorders (DSM IV), and the controversies over the shifts in how we term “grief” after the death of a loved one. At the end of the report, almost as an aside, they mentioned that the issue of “Internet Use Disorder” and video gaming addiction has been added as an area of “study” by the group of researcher/psychiatrists who make changes to the manual, which establishes what is considered a valid diagnosis and how ailments should be treated. It seems that video gaming, in particular, have come under scrutiny. And while some basic research yields some news stories that are alarming (although that could be said about any topic you search for), I have yet to see any empirical research data about the negative impact of gaming. Which is not to say I don’t worry about it. I have three boys, and the older ones play a lot of games and use a lot of apps, and we are constantly seeking a balance between time on technology and time to run around outside in the fresh air. But I still worry about the amount of time my own kids spent with technology, and I worry when I hear students talk about their weekend activities that revolve around gaming, and only gaming. And here I am, launching into a full-blown video game design unit with my sixth graders! Sigh. I’ll be honest — even as a full believer in the power of technology and digital tools to expand writing and communication possibilities, and as an advocate for putting more tools into the hands of young people so that they can learn to make choices and have agency when it comes to their digital activity, I also worry every now and then that I am going down the wrong track, and encouraging a reliance on the screen. But, by framing my work around composing and critical thinking and engagement, I convince myself and, I think, my constituents (parents) that our work is powerful and meaningful and worth the screen time. My friend, Sandy Hayes, has edited and published all of the Ignite sessions from NCTE (Ignite sessions had a format of 20 slides, transitioning every 20 seconds), and here, I talk about short-form writing and what it mean to our definitions of what writing is, and becoming, and whether we validate the many shortened ways that people write in different spaces.